Getting Things done is a book written by Productivity pundit David Allen who is an internationally recognized author whose most of the works are based on organizational productivity. Getting Things done ( or GTD as it is called) is a methodology that aims to make life better by teaching you things that help you in organizing your tasks well. It's a fact that in this fast moving world, where we rat race and compete with each other in this life, we often tend to leave a void behind. This book aims to fill in this void. We somehow fail to understand certain minute things that will not only help grow as an organized individual but also as a better person. As David Allen calls it, this GTD methodology will drain out all the stress from your sophisticated life and GTD will only make life easier. Each Chapter of this book covers various aspects that will help you in managing your tasks better. Through these chapters, David Allen has made a powerful impact. You might find it boring going through most of the topics but trust me it can change your life or at least make it less stressful if you religiously follow the GTD. This book is for people who crib that they have many things to do but unfortunately, they do not have much time and prioritizing the important tasks leaves behind an apprehension that something important is being missed. Trust me many of us might have come across such a phase. The author has given many useful points for all who belong to this league. This can make life easier. The book gives an overview of the process of how to get work in a better way, how to implement the work in a better way and it provides better insights into it. This book helps us to get rid of our organizational issues that we come across in our day to day life. The best part about the book is that it will make you think about your productivity, the techniques are easy and explained in a better way that can be easily understood by all. This book offers powerful and practical strategies for increasing your organisation, efficiency and creativity. I highly recommend this book. Never forget to carry a notebook with you when you read it. There are many interesting points that you might wish to note that might help you. For those who are used to working in a fast paced environment then the techniques mentioned in the book might come handy for you. Stay Organized and Focussed and may you lead a stress-free life with maximum productivity. 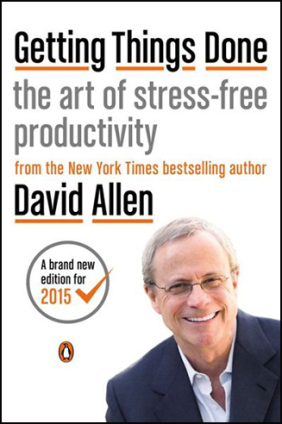 David Allen is widely recognized as the world’s leading authority on personal and organizational productivity. His 30 years of pioneering research, coaching and education of some of the world’s highest-performing professionals has earned him Forbes’ recognition as one of the “Top five executive coaches” in the United States, and as one of the “Top 100 thought leaders” by Leadership Magazine.